Ancient Roman funeral processions were led by professional mourners who wore masks of the recently deceased's ancestors. But because the masks were made from wax, none survived. 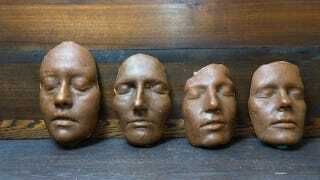 Recently, a group of archaeologists created their own wax masks using their own faces, and the results were stunning. The researchers, who study at Cornell University, recently presented their work at the annual meeting of the Archaeological Institute of America. Called imagines maiorum, the masks were made from beeswax — a very expensive substance at the time. The researchers say the choice of material was a way to express power, social distinction, or worldliness. But it also produced lifelike qualities, often serving as an effective stand-in for human body parts. As the experimenters can attest, wax is a rather sensitive and unstable material. The mockup masks, which were made with a modern recreation of ancient beeswax, have been sitting inside a protected display case at Cornell. But even after a short time, the surface of the skin appears to have tiny pits and holes, Jarriel said. In Roman times, the masks would have been constantly discolored and degraded by candle flames and smoke as well as the occasional handling during funeral processions and the copying process. (New households forged by marriage needed their own sets of ancestor masks.) "They were constantly transformed and probably never looked pristine, and I think probably in the end more like zombies than anything else," Annetta Alexandridis, an associate professor of art history at Cornell University, told LiveScience. Read the entire article at LiveScience. Related: This death mask just sold for $260,000. Can you guess whose it is?